﻿ Page 10 - Northeast In-Sites, The Newsletter of the Northeast Campground Association, Inc. 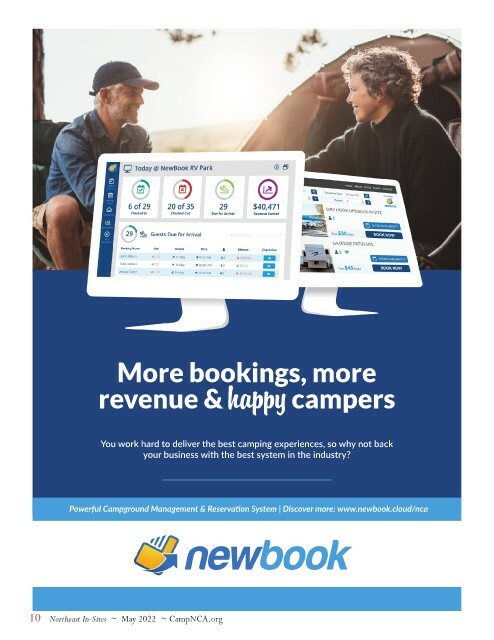 Page 10 - Northeast In-Sites, The Newsletter of the Northeast Campground Association, Inc.
2019 NCA Trade Show here we come! DURA-BILT PRODUCTS, INC.                               NCA SCHOLARSHIP FUND INC.
FAMILY & BUSINESS SUCCESS                              NELSON & SMALL, INC.
INSIDER PERKS,  INC.                                   PARTY PEOPLE, INC.
KIBBE’S INC. PERFECT STITCH EMBROIDERY, INC.
LANCASTER LOG CABINS                                   PULL START FIRE / BETTER HORSE INC.